This summer, the Musée de l’Orangerie is introducing a captivating dialogue between Monet and America. The large Water-lily (called Nympheas) decors, painted by the impressionist artist at the end of his life and now adorning the two large rooms of the Museum, are said to have inspired a whole generation of American abstract artists after World War II. As a matter of fact, in 1952, the painter Ellsworth Kelly discovered the works representing the pond and water lilies of Monet’s Giverny garden; he was followed by the art critic Clement Greenberg and then by Alfred Barr, director of the Moma, who then bought a large panel of these Nympheas for the collections of the New York Museum. They are characterised by thick impasto paint and compositions without skyline. Twenty works by the greatest American names of the post-war period, Barnett Newman, Jackson Pollock, Mark Rothko, Clyfford Still, Morris Louis, Philip Guston, Mark Tobey, Sam Francis as well as Helen Frankenthaler and Joan Mitchell reveal the connections and similarities between their abstract canvases and the ones by the Master of Giverny. A special tribute is given to Ellsworth Kelly through his small Tableau Vert, a living response to Monet's work. These representations of nature combining the notions of "all over" and "color-field" techniques define "Abstract Impressionism", ie an approach where the skyline has disappeared, where there is no question of centered space, and where the captivating and absorbing colours create a floating space. When exiting this beautiful exhibition, why not cross the Seine and head to the Invalides to immerse yourself in another universe? 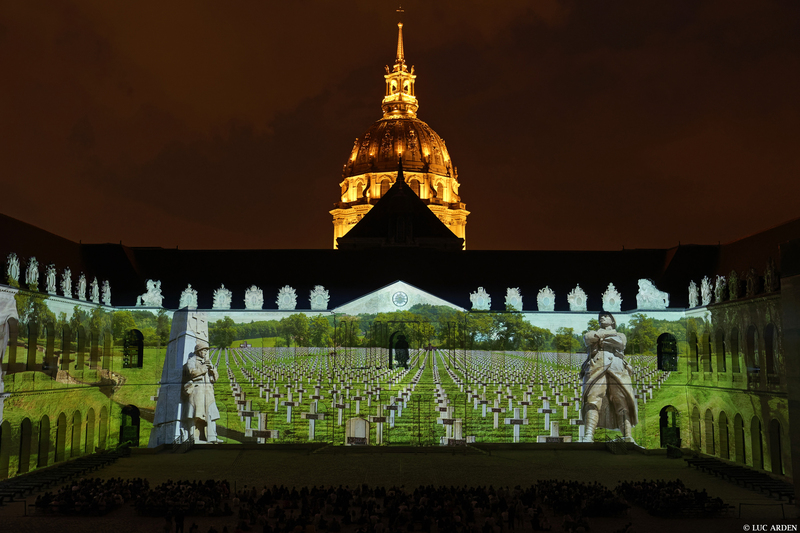 Les Invalides is definitely the ideal choice of venue to commemorate the 100th anniversary of the end of World War I. Show-goers are in for a spectacular leap in time which will make the Cour d’honneur’s historical walls tremble. This summer spectactors can see “the birth of the post-war new world” through the eyes of a child, thanks to Martin’s wartime memories (he was 7 in 1914). The sensorial experience, with projections on walls and stories told by famous narrators, can be extended by a nocturnal walk inside the Dome lit by a thousand candles around Napoleon I’s cenotaph.